With reissues, a box set and vinyl all hitting shelves this year it’s a good time to be a Big Star fan, if albeit, a somewhat confusing one. A quick wrap-up: Two weeks ago saw the release of the long-standing double CD version of the #1 Record/Radio City LPs. The music contained within is obviously A+, but the presentation is once again lacking in that 24 tracks is a lot to make it through on a single disc. (tip: just break the two LPs up in iTunes, rename them, and add a jpg of the original album artwork) As for the two bonus tracks on this edition, by my count the single edit of “Oh My Soul” is the only one previously unavailable, as the single version of “In The Street” was most recently included on the 2008 Thank You Friends: The Ardent Records Story compilation. So, if you already had the disc, this release isn’t really all that revelatory; what is though, are the long awaited Big Star vinyl reissues that dropped the same day and news of the four disc Big Star box set, entitled Keep An Eye On The Sky, due out September 15th. File the following under interesting Big Star curios. 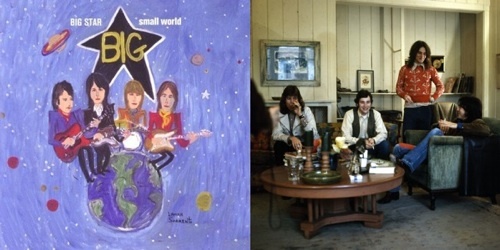 The Big Star tribute compilation Big Star, Small World was originally slated for release in 1998 but, due to the original label going under, did not see the light of day until 2006. This is no more readily apparent than from a quick glance at the artist lineup: Afghan Whigs, The Gin Blossoms, Julian Hatfield, Teenage Fanclub, Whiskeytown, Wilco, Matthew Sweet, The Posies, etc. About half of the covers included are worth hearing, especially if you had an interest in late ’90s power-pop/Americana, but I wouldn’t be surprised if we see an all new, revamped, ’00s tribute to the seminal group in the next couple of years. Whereas, I just went and listened to “Blood on My Hands” and it was mediocre and non-memorable. Woo, music-specific blog spam! Is there anything specifically good about the vinyl Big Star reissues other than just that good sound? RE: vinyl reissues, Im just happy to have non-scratched copies. love all three of these tracks. i had first heard ‘thirteen’ per elliott smith’s version. unfortunately, the whiskeytown & matthew sweet files seem to be corrupted, as they cut off prior to the song’s end (at least in my itunes). The Concord/Stax re-issues use the master that was done several years ago from original analog tapes for the now defunct SACD format, and they really sound better than the 90s CDs. I agree that they could have expanded the packaging, or just issued 2 albums. I think folks wil be very pleased with the Rhino Big Star boxed set and the Rhino HandMade edition of the Chris Bell solo material, I am The Cosmos (now 2 CDs with alternate versions, alternate mixes,and previously unreleased material) – Sept 15 and 29 respectively. I enjoyed working on both projects, including mixing some things for which no contemporary mixes existed.